***INTERNATIONAL DAY 4/11!!! ***SCHOOLS CLOSED for Spring Break 4/15 to 4/22!!! ***B.O.E. Meeting 4/23 at 7:00 pm in the AHS Library!!! ​We are dedicated parent volunteers working in close partnership with teachers and school administrators across all three of our schools: Concord Road Elementary, Ardsley Middle School and Ardsley High School. Together we apply our different perspectives and focus our energies on realizing the potential of every child. The Ardsley School District prospers because we work hard to bridge connections between home and school. We do this by sharing information, providing resources and getting parents involved in the classrooms. Through service opportunities for both students and families, we create lasting bonds in the community by sponsoring fun family event and so much more. We are your Ardsley PTA and we value your feedback. Please feel free to contact us anytime and click here to volunteer! April 3 — Grades 3 and 4 NYS ELA Exams! April 4 — Grades 3 and 4 NYS ELA Exams! April 5 — Grades 3 and 4 NYS ELA Makeup Exams! April 10 — LAST DAY TO BID ON AEF SPRING ONLINE AUCTION ends 10:00 pm TONIGHT! April 11 — INTERNATIONAL DAY! April 25 — Lice Check! April 3 — NYS ELA Exams! April 4 — NYS ELA Exams! April 5 — NYS ELA Makeup Exams! April 11 — 3rd Marking Period Ends! April 26 — NYSSMA + Report Cards Online 3:00 pm! April 3 — National Honor Society Induction 7:00 pm in Auditorium! April 4 — End of 3rd Marking Period! April 10 — 10th Grade Poetry Slam + LAST DAY TO BID ON AEF SPRING ONLINE AUCTION ends 10:00 pm TONIGHT! April 12 — Report Cards Available Online! April 26 — Sports Tournament! ​April 30 — Band and Orchestra Concert 7:00 pm! ​We welcome your participation. Volunteering for the PTA is a great way to meet people, get involved with our schools, and make a direct impact on your child's education. Whether you have a little time or a lot, we have a role for you. The PTA offers a number of different fundraisers throughout the year to support our children's education. Our goal is to provide many options so everyone can find something to suit their taste and budget. We have a few upcoming events as well as a number of year-round activities! Please, make sure your DeCicco's card is linked to the Ardsley PTA! The Ardsley PTA has always been incredibly grateful to DeCicco & Sons for their generous donations over the years. 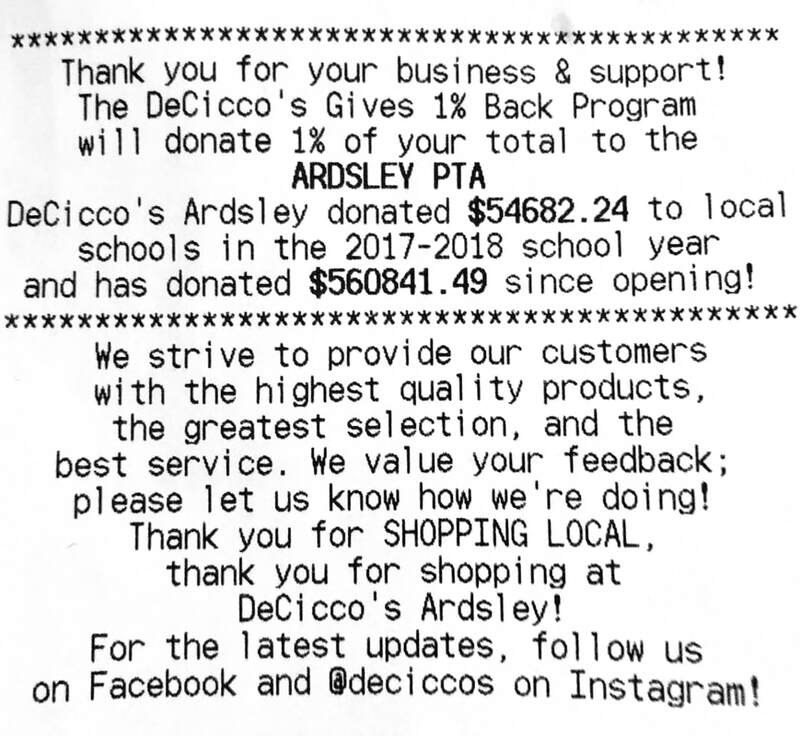 As long as your DeCicco & Sons rewards card is linked to the Ardsley PTA, they’ll continue to give back 1% of your purchases directly to our schools! HOW AMAZING AND SIMPLE IS THAT? Please, be sure to thank the DeCicco's managers and staff whenever you see them. You don’t have to bust-a-move to let them know just how much our school appreciates their generosity for our kids. To purchase tickets reach out to parents/students in Select Chorus or click below to email! Are you signed up to get our monthly PTA e-blasts? Well, what are you waiting for? 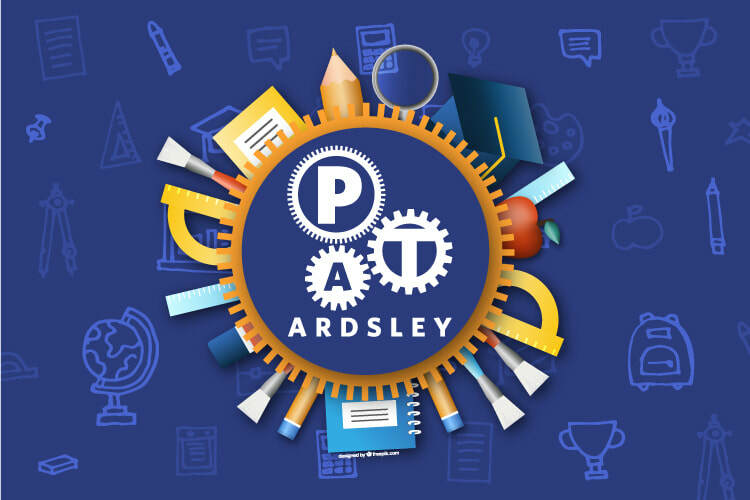 Receive important dates and all the latest news from all three of our schools AND the Ardsley Community. The Ardsley PTA wants to keep you informed, so won’t you let us?